As Occupy Canada protesters across the country are spending a second day in tents set up in urban parks, protesters in Toronto have decided to march again through the downtown core to a shopping area. As Occupy Canada protesters across the country spent a second day in tents set up in urban parks on Sunday, protesters in Toronto launched another march in the city's downtown core and gathered at a central shopping area. Members of the Toronto group who set up an encampment at St. James Park just east of the financial district, were on the move again, chanting, "Whose streets? Our Streets!" on their way to Yonge-Dundas Square, the CBC's Natalie Kalata reported. Police officers lined at least one entrance into the nearby Eaton Centre, Kalata said as protesters asked for other people to join them at the square for a rally. Shoppers came out of the mall to watch and some joined in. Protests inspired by the Occupy Wall Street movement in New York City, which began weeks ago, emerged in at least 15 Canadian cities, including Vancouver, Calgary, Regina, Winnipeg, Toronto, Montreal, Quebec City and St. John's. The protests are inspired by a grassroots movement that has spread to more than 80 countries and featured demonstrations against global financial inequality and corporate greed. While locations varied by city, the protests and sit-ins generally included marching to financial districts, city halls or other important economic venues, before heading to a park or camp site. Niko Salassidis, who set up the Occupy Toronto Facebook group and is also camping out in St. James Park, said protesters would spend much of Sunday also planning for a "large impact for Monday as a demonstration for [when] the Stock Exchange opens." A meeting at the Toronto park was set for 5 p.m. ET. If you're at the protests or camps, send us your photos and videos. TD Bank Group spokesperson Wojtek Dabrowski told the Toronto Star that employees had been "informed about possible disruptions to service" on Monday. "While we’re not expecting disruptions to service at this time, we are prepared to close branches or offices if there are concerns to safety." On Saturday, demonstrators made peaceful protests across the country, largely as a stand against what they see as a corporate system which favours the wealthy but disregards the majority or "the 99 per cent." Two men were arrested in Toronto on Saturday at a downtown business complex. One of the men, according to police, had a concealed hammer. Many joined in to give voice to their own concerns — including aboriginal rights, health and poverty issues, environmental causes as well as labour issues including many Air Canada workers upset with the federal government’s intervention that ended their strike threat. "The [main] problem is wealth distribution," Toronto camper Matthew Webb told CBC News on Sunday. "Young people can't get jobs, old people can't get help and the middle class is rapidly disappearing." Webb, 34, said the protest was a "vibrant example of democracy" and said he had set up a kind of sign shop with markers and cardboard for people to create their own messages. He added he's now getting help from local art colleges with those supplies. In Toronto, about 3,000 people first gathered at the financial hub of King and Bay streets but that number was cut in half by the time they made it to the park Saturday afternoon. About 100 people set up tents St. James Park. Some websites associated with the protest say they expect them to remain there for about a week. While some protests overseas became violent, cars and ATMS were torched in Rome, the ones in Canada remained peaceful. 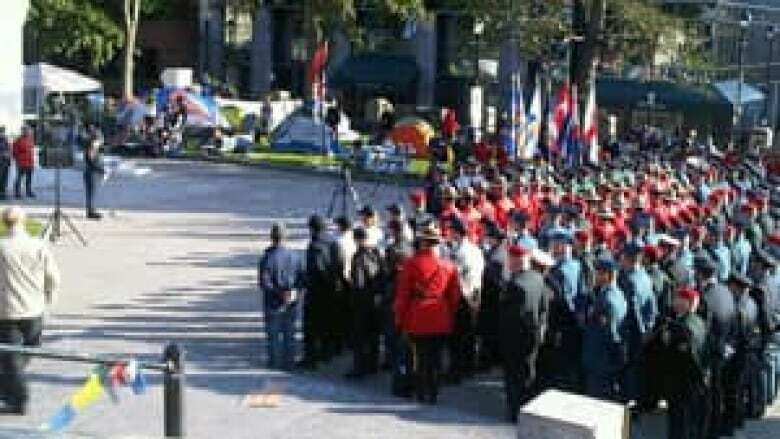 On Sunday morning, RCMP and Halifax police gathered on the Grand Parade — where about 40 protesters have set up their camp — for an annual ceremony honouring peace officers killed in the line of duty. Before the service, Sgt. Kevin McNeil said police were prepared to gather outside the square, but in the end there was plenty of room for both groups. "When we came in this morning, one of the young gentlemen down here, he offered to clean up some of the chalk markings that had been around where the actual monument is, so that was a good gesture," McNeil told CBC News. In Vancouver, a crowd of between 2,000 to 3,000 protesters packed a one-block square behind the city's art gallery. It marked the highest turnout in Canada. The demonstrators were well-organized, establishing a food tent for those planning to stay for the long-haul. In Edmonton, some protesters were jumpy Saturday night as rumours circulated that police might clear them and their tents from their camp site in the city’s Churchill Square. But no action was reported. "Right now, we're worried about short-term problems," said Bryan Hyshka, 21, a volunteer at the camp's food tent. Hyshka said organizers were trying to secure portable toilets. The web designer added that many of the protesters had to be at work on Monday, so many are unsure whether they could occupy the square, across from city hall, for a week. "Personally, I'm planning on staying until Monday," he said. "After that, I'll be back and forth during the week." Hundreds turned out in Montreal’s Victoria Square, which was dotted with a dozen tents and coolers on Sunday morning. Frederic Carmel, a 25-year-old office administrator, said he booked the next week off work and planned to camp out during that time. "There is enormous inequality in the division of wealth," he said. "It needs to be better re-distributed."